Barstow pictured via The New York Times. Everyone’s Coming to the Guild! Come with Us to China! Barstow was an educator, amateur filmmaker, and NYU Alumnus. His 1956 film Disneyland Dream was named to the National Film Registry. Barstow is known for his Barstow Travel Adventure amateur film series. These films are held by Center for Home Movies, and can be viewed in their collection on Archive.org. The Back Table NYU Archive and Special Collections. 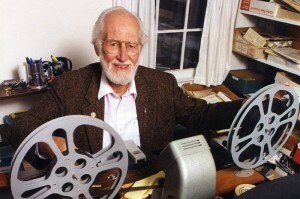 "Robbins Barstow, Home-Movie Maven, Dies at 91," The New York Times, Nov. 13, 2010. As seen in Whalewatching Adventures in Baja California (1986).